Tight squeeze ... after work commuters board a train at Wynyard Station. 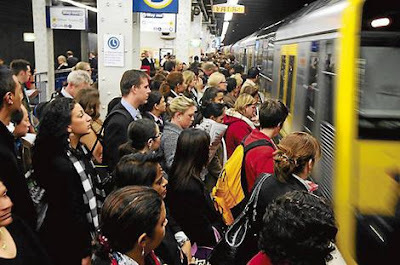 SOME rail passengers are being left behind on platforms and bus commuters are enduring long queues as motorists baulk at the soaring price of petrol and switch to public transport. Morning peak-hour numbers on CityRail vastly exceed the State Government's "high-growth" predictions, and bus corridors are suffering a commuter crush. There has even been a surge in demand for inter-city Greyhound coach services. The rush for public transport comes as motorists begin to ration their petrol use. Sales of unleaded petrol fell by 4.4 per cent in the first three months of the year. Garry Glazebrook, urban planning lecturer at the University of Technology, Sydney, said traffic growth was beginning to slow because fewer people could afford petrol. "In Sydney, the price of petrol and the tolls combine with interest rates and inflation, and there is less room in the budget," he said. "Something has to give." It is possible that a huge proportion are shifting to rail. In the 12 months to February, there were almost 1.2 million new passengers on the Bankstown line, a growth rate of 8.4 per cent. In 2001, the Government's Transport Data Centre predicted a worst-case scenario in which the network was hit by 2 per cent yearly growth to 2021. In the year to February, that figure was more than 4.7 per cent. Patronage climbed 7.4 per cent on the Inner West Line, 6.3 per cent on the Western Line and 6.2 per cent on the East Hills Line. Trains are so full on the Bankstown and Western lines that some morning commuters are being left behind. Meanwhile, patronage on the Hillsbus morning peak service to the city soared from 170,000-odd passengers in September 2005 to almost 300,000 in August 2007. "We had about 65 buses in 2005 operating on the M2. It is now closer to 140 buses coming out every morning," said Hillsbus's chief executive, Owen Eckford. "We have reason to believe that growth is likely to continue." A RailCorp spokesman, Paul Rea, said the increase in jobs was driving patronage. "This factor is so dominant that it makes it difficult to identify any correlation between movement in patronage levels and … factors such as changes in petrol prices." But Dr Glazebrook disagreed: "There has not been a 6 per cent growth in jobs, because that would mean 15,000 more jobs." The Government is pinning its hopes on its new underground metro lines to tackle the mounting crisis. Although it has invested in several infrastructure upgrades and the new Epping to Chatswood line, capacity improvements are still urgently needed. Analysis released this week by the energy economics group EnergyQuest shows motorists are being squeezed by petrol prices and have resorted to self-imposed rationing. Consumption of unleaded fuel fell by 4.4 per cent in the first three months of this year. Overall, petrol sales fell by 1.2 per cent to 55.7 million litres. Despite the reduced demand, increased importation and higher oil prices have taken the cost of petroleum imports to more than $1 billion a month, said EnergyQuest's chief executive, Graeme Bethune. "There is no denying that record prices for petrol are causing Australian motorists to rapidly change their buying habits," Dr Bethune said. "Our research shows motorists are doing what they can to manage their fuel costs, by driving less and using the cheapest fuels they can find." The higher petrol prices are proving a boon for Greyhound's coach services. The company's chief executive, Robert Thomas, said it experienced customer growth in the past 12 months well beyond any figures recorded over the past decade. Greyhound garnered an extra 18 per cent of passengers in the year to April on its Sydney-Byron Bay route, and an extra 16 per cent on the Sydney-Canberra route. "Petrol is starting to really have an impact," Mr Thomas said.